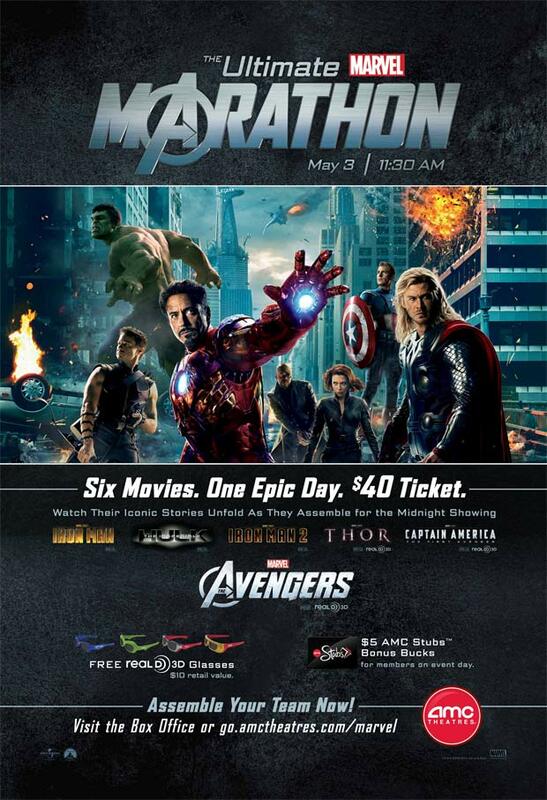 In preparation for The Avengers, AMC is hosting the Ultimate Marvel Movie Marathon. Starting at 11:30am on May 3rd, AMC theaters will be showing all five movies that lead up to The Avengers debut at midnight. Along with your $40 ticket you will also receive a pair of the Avengers real 3D glasses ($10 value) and $5 in movie stubs bonus bucks (for members on event day). Tickets for select theaters are on sale now with more to follow on March 16th. For a current list of participating cities please visit AMC theater’s website. ← Win a Hunger Games Giveaway Pack! Oh please let March 16th reveal a theater within driving distance! This looks to be insanely, crazily, mad fun!